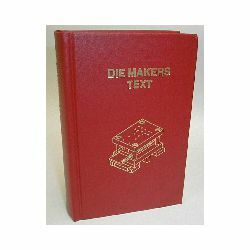 Die Makers Text intends to teach anyone, with no previous knowledge about dies, something immediately useful. And "old salts" in the field might learn something too. Since there are so many different ways to solve the same problem, one can never stop learning in the tool making trade. This book is based on the author's 40+ years of experience. An extensive troubleshooting section of the book can help you recognize a problem when you see it and understand what is supposed to be happening in the die that is not. Chapter information includes: Die components, Types of dies, trouble-shooting, die setup, changeovers, new tool tryouts, problems most likely overlooked during repair, and more! This hard bound book has 493 pages, hundreds of illustrations, a full index and glossary. SHIPS FROM: This book is sent directly to you from a warehouse in Indiana.